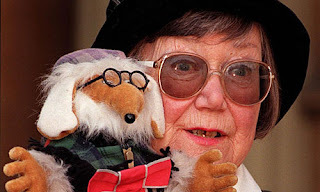 My knowledge of The Wombles is limited to the TV series of the 1970s and the songs of Mike Batt, I may have read the original novels written by Elizabeth Beresford, but the voice of Bernard Cribbins and the catchy tunes are more vivid in my memory than the books. I even went to see them live in concert in Wimbledon AND I had an Orinoco suit. According to her page on Wikipedia Beresford grew up surrounded by some of the greatest writers of all time, who were friends of her parents (also writers), HG Wells, DH Lawrence, Somerset Maugham, George Bernard Shaw are amongst those listed. The TV series were narrated and all the characters voiced by Bernard Cribbins, there were 60 x 5 minute episodes made. The narration style, with Cribbins telling the stories and being the characters seems quite primitive in times of CGI, yet it gives some truth to The Wombles ability to create things from what they find. A slick cartoon effect would not feel right for The Wombles, the stop go animation is perfect. The later 1990s series had countless voice artists and writers and may not have had the feel of the original, but the characters proved popular and a further 52 episodes were made. There are supposed to be new episodes due to be shown in 2015. Mike Batt's music for the show has remained popular to this day with albums still being released and even an appearance at Glastonbury. The songs were big sellers on release in the 70s, with several top 40 hits. Here is a bit of Wombles, wishing you a Wombling Merry Christmas and an episode following.